Empty canvas thrills and challenges me. It makes me feel responsible for it. It depends on my hands, eyes and thoughts if I am able to convey the harmony and aura of nature – all that my heart feels. Will these painted moments excite the people through the years, bring them peace and pleasure of being, or just pass by. Alexander Andreev was born in Saratov, Russia. Graduated from the school of art in Vilnius (Lithuania), and the Institute of Civil Aviation Engineers in Kiev. 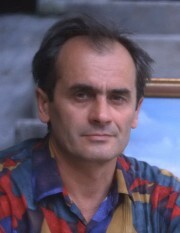 A member of Designers’ Union of Ukraine, an honorary member of the International Foundation “Cultural Heritage”. For the contribution of art into cosmonautics of Ukraine and Russia was awarded with Kondratyuk Medal and Kozhedub Medal by the Cosmonautics Federation of Russia.